Happy Monday! Boy oh boy--it is cold here today. Yesterday it was in the high 70s and today the temperature plummeted to a frigid 45 degree high! YIPES! Gonna get this posted, get some laundry folded and grab a cup of hot chocolate! 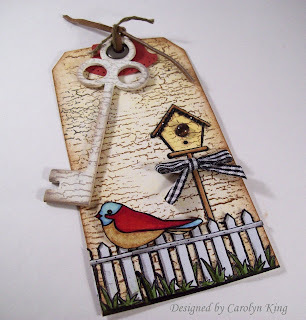 I created this whimsical tag using the new set by Rupa for Gina K Designs called Home Tweet Home! I stamped the image twice (so I could cut off a few of the fence posts to make the fence long enough for the tag!) and colored them with Copic markers and cut them out. I assembled them over the tag that I had sponged with caramel and cocoa inks (Stampin' Up!) and stamped Weathered (SU!) background over it with Frayed Burlap distress ink (Ranger). I painted the Bazzill cardstock key with ivory ink and stamped over it with the weathered bg too. After getting the look I wanted on the tag itself, I added the birdhouse and fence. I added some black crystal stickers under the roof of the birdhouse and a dew drop on the house opening. Finally, I stamped a bird image from the set and colored it pretty brightly and popped it up on a dimensional. (I doubt if there is a bird that actually looks like this--but I just like to create whatever I feel like rather than being factual!) I definitely wanted to get that pop of red in there. After adding the images, the key and the top tag loop, I added a little gingham ribbon to the bird house as a final touch! When the card was complete, I asked my husband what he thought---he said "Do birds need a key to get into their houses?" DOH! Have a wonderful day--stay warm! I hope you have a wonderful Holiday with your Parents and Siblings! Cute card! I can't sympathize too much on the weather - we have -2 here and that's before factoring in the wind chill! How adorable is this?!! I can see this on a gift for a bird lover. Um..it's 77 here..I'm ducking, I know you're throwing stuff. Nice to know the Birds have a secure home! Love the tag. It looks so weathered. Your tag is Gorgeous and So Cute! !...we're in a deep freeze right now...windchills of -40 celcius...winter...blah! !...Keep Warm and Happy Holidays!! Wow you probably feel as cold by you as we do here! We are in the single digits today with windchills in the negative numbers! Brrrr...collllddddd! I have to keep asking "why do I live in Wisconsin?" ha ha! Your tag is adorable! And as for your hubby...I swear they never understand...that is so something my hubby would say too! hee hee! I think it's lovely! I loved this tag when I saw it during the release party! It's just adorable! I too can not sympathize with you on the cold weather you are having today...come to Wisconsin and visit, we are in the minus degrees with the wind chills, 7 degrees without...bbrrr! Love your tag! I have to say though that I wish it were 45 today. It's 17! BRRRR! I'm just glad I don't live in Canada or Alaska. cute tag Cammie .... and I will also say awwww poop ... I was hoping it was! WOW, Cammie!! This tag is ADORABLE!! I had so much fun browsing through your blog....your work is amazing! Thanks for your sweet comment on my blog! Beautiful tag Cammie! Merry Christmas to you!!! This tag is too darn cute & I luv the colors of the bird! Merry Christmas to you & your famly! I wouldn't think that birds would need a key to get in, but in todays day and age you just never know how security concious birds might get! LOL Love the tag! Your tag is fantastic! I love the key here! Merry Christmas to you and your family Cammie! That's some intricate cutting! But so great looking against the weathered bg. Love the colors on the bird. Enjoy your family time! OMGoodness, this is adorable, Cammie!! It was 9 degrees here today. N-I-C-E....not! Travel safe and have a great trip! so sweet!! !love the gingham ribbon you added. Ohhhh cute!!! I'm sure lovin' that birdie and can't wait for my new stamps!! LOL Have a wonderful, family fun holiday time!! Oh I LOVE this! Love the weathered bg especially...I love old looking things...except myself...haha! Your DH sounds like mine with his wise crack *snorts* but it did make me giggle, rofl! REALLY chilly here this am...we got sleet...yuk. LOL @ your husband! I love what you did with this tag! All the elements are fabulous! Girl it's cold here too...-36C so close to that in F too with the windchill yesterday...honest to goodness you'd think we'd all hunker down and stay in to stamp BUT no...there is Chrismtas shopping to be done...ack! I love your tag its absolutely beautiful, but I must say I burst out laughing when I read that you were freezing at 45 degrees! That would be warm and balmy for us Wisconsites! Right now its about 25 degrees below ZERO windchill! Our cars won't start, and my hands are going numb as I write this! LOL! In 45 degree temps, I'd be outside without a coat on! LUCKY YOU!LOL! Have a great day! Freezing at 45 degrees....girl, you've been away from PA too long. LOL! I love your tag with the key. So cute. LOL'd again at DH's comment, hehe! This is supah!!! Men are so funny! My sister told me that she was had white flock in one tidy tray, and clear ep in another the other day. Her DH walked into the room and said, "What are you doing now, snorting coke?" Your tag is adorable!!! We had freezing rain last night and it is super cold here too. Stay warm!!! This is one gorgeous tag girl!! :) I'm looking forward to taking a Holiday vacation myself!! Hope yours is a very blessed one with family and friends!! Take care and be safe! That is something my husband would say too!!! TOO FUNNY! My DH never would have thought of that..don't know what that says about him, LOL!! Gorgeous project girl..travel safely!! Your tag is adorable! I love the bird-so cute and colorful! Even the men that love us say stupid things...such is life. If they did need a key to get in at least you provided it!!! It has been -20 F here, not including the wind chill -46. Brrr I don't like it. Love this!! The coloring is so vibrant and really pops against the aged background! !